Forty-five years ago this week (it was Flag Day, that's the only reason I remember the exact date still) I had heart surgery to fix a heart murmur I was born with. I was 12. I saw that it was Flag Day this week and I did the math and came up with that rather staggering number - 45 - and so I also noticed it tonight on MSNBC when they said that the Watergate break-in was 45 years ago this week. I didn't remember that, but then it wasn't big news at the time, either. It only became big news later on. But that means that happened while I was in the hospital recovering - I was really bored sitting in the hospital for a whole week, at least after a couple of days when I started feeling better. I remember that well. I don't specifically remember watching the news, but everybody watched the evening news back then (usually referred to as "watching Walter Cronkite" the way I remember it) and it's possible I did. I do think I knew about that break-in pretty early on. But that might just be in my head. I do know I remember being mad about the Watergate hearings being all that was on on the TV - this was during the summer, I'm assuming that was in 1974. And I remember Nixon resigning and I know I knew the basics about it at the time, at least, but it's hard to be sure how much of all the stuff that happened in that two-year time period I really remember from the time it was happening and how much I learned later, from All the President's Men (both the movie and the book) and so forth. I do think now that all of that may be a lot of the reason I'm so interested in politics today, though. Oh, I almost forgot to say that my freshman year at UT was also Earl Campbell's senior year, and UT was ranked #1 going into the Cotton Bowl against Notre Dame - which we resoundingly lost - but Earl won the Heisman and football season was a blast. The football players lived in Jester East, which was the other building, and normal students didn't actually have much interaction with them, unless they happened to be in your classes or something. They even had their own dining hall. My one personal interaction with Earl was running smack into him in a stairwell later on - about all I can tell you is that he was huge. It was like running into a wall. I yield to the sweet yoke." Let's talk about the Bicentennial. 1976 was a year of American-everything - we sang almost exclusively American songs in choir, even. It was one big, mostly really boringly-presented and probably inaccurate history lesson that lasted for a whole year. It did leave a lasting impression on some things, though - like quilting more or less became popular again because of it. Schoolhouse Rock even did special Bicentennial segments. There was sort of a fad for things like the tall ships and of course there was a ton of merchandise. I remember somebody saying at the time "the big bore is almost over" and that's about how most people felt about it after it had been going on for a while. In the non-classical music world, it was the year of "Bohemian Rhapsody" - which I loved the minute I heard it - and "50 Ways to Leave Your Lover" and I think disco was starting to be a fad by then, too, although it didn't hit its peak until later. I see "Convoy" on the top 100 list so I guess it was the year of the CB radio fad, too - one of the more inexplicable fads that I remember. There were a bunch of faddish songs that year too, like "Afternoon Delight" and I think "Squeeze Box" could sort of be considered one too, since it doesn't sound like anything else the Who did. "Welcome Back Kotter" was a huge thing, too. We were up to maybe 5 TV stations by then - in Houston it was 2, 11, 13 (which were the networks) and then 26 and 39, which were mostly reruns, so there still wasn't a lot of choice about what you watched on TV. The Wikipedia page for the song says that the length was supposed to be cut down for the radio, and Elton had enough pull at that time that he was able to force them to release it as is. (Before I started this, I didn't realize how many big hit songs had their own Wikipedia pages.) I think I responded to the tone of desperation in this song, as a teenager. I also think I was vaguely confused about what the song meant because I had gotten the general idea by then that Elton John was gay, but really I think the meaning was pretty clear ("altarbound, hypnotized/sweet freedom whispered in my ear") and what I thought it meant was basically correct. I mentioned before (in the 1970 entry, I believe, if you really want to know) that at some point I was given a little dinky cassette player for Christmas, and at some point (maybe the same year or maybe not) I was also given a cassette of "Goodbye Yellow Brick Road" - I'm not sure any more about what year was what, but GYBR came out in '73 so that's the earliest that part could have happened, anyway. I know I also got a Jackson 5 album and it's possible that all of that happened in 73, because certainly the Jacksons were still popular by then. (I think "Ben" had come out by then so Michael was already having some solo success as well.) I know I listened to the Goodbye Yellow Brick Road album a lot because I still pretty much know every song on it. Later I bought or was given an Elton John songbook with the music to a lot of the early John/Taupin output - I remember picking out "Skyline Pigeon" on the piano and also some things I had never heard before, like "Where To Now St Peter?" - and I remember playing "Your Song" in the choir hall at some point and everybody singing along. In 1975, I of course did not have a drivers' license because I was just turning 15, but I took drivers' ed that summer and I had a learners' permit, and the fact is that my mother was sick of driving us everywhere, especially my endless choir practices and various related activities, and once I got the hang of driving, she let me drive around town without her along quite often - more and more as I got closer to being 16. She claimed later not to remember this. I was thinking of "Sweet Home Alabama" just because I remember it so vividly from that year, but the whole Neil Young business sticks in my craw and I couldn't bear to use it. (Wikipedia has a whole page on the song including a section on the controversy in case you don't know what I'm talking about.) The members of Lynyrd Skynyrd have apparently claimed at various times that they didn't mean to say they supported George Wallace, but if that's true they should've made that clearer. I do buy that they may well have meant the lyrics generally as a sort of "not all Southerners" thing, in a way, but still, it's not much of an excuse. So as a general representative of that kind of music, I give you the Doobie Brothers instead. They're a California band, as I understand it, but it's about the South, at least! And I loved this song at the time, although I'm not sure I really knew who sang it back when I was 14. The Doobie Brothers were not as famous then as they'd become later on. Added: One thing about Guardians of the Galaxy that I apparently failed to take in the two times I saw it in the theater, and I'm sure many or most of you are ahead of me on this - I didn't really snap to the big gap between the time Peter Quill was abducted by aliens (1988, the movie says) and the time the songs on the Awesome Mix were from, in the 70s. In other words, they were not the songs that he would have chosen at the time, they were the songs his mother liked when she was his age, maybe. Meaning that his mother was probably somewhere in my general age range, maybe a little younger, if anything. (I was 28 in 1988, plenty old to have a kid.) I only figured this out because I was looking up the songs of 1973 the same night I was watching the movie - although actually I think it was the date of his abduction that I was a bit unclear on. Choir was really the only thing I really cared about in high school. I could coast through most classes - with the exception of algebra, which I spectacularly failed to get the hang of and almost failed that year. I just squeaked through. I did better in geometry, the next year, but nobody found a way to explain algebra to me at that time in a way that made sense to me. I'm not sure anybody tried too hard to explain it to me, quite honestly - it was the 70s and the idea that a girl would need to know higher math was still pretty radical. The music that was most popular then is music that would mostly be considered very uncool nowadays: The Carpenters, John Denver, Olivia Newton-John. I do remember "You're So Vain" being a big thing - I think I started being influenced to some extent by hanging around with older kids - I had several friends who were juniors that year. That may be why I knew all about "Cover of the Rolling Stone" too. Remember how I said I was going to stop talking about my childhood so much because there weren't any big events after we stopped moving all the time? Yeah, well, I completely forgot about the year I had heart surgery. (Hey, it was 40-odd years ago. My cardiologist couldn't even find any records of it.) It wouldn't be as big a deal now. I had a heart murmur, they'd known it since I was really small, and 1972 was the year they decided they needed to fix it. Nowadays it would be three days in the hospital, but back then it was 10. They didn't believe in taking any chances in those days. The pedi unit was up on the top floor of that same building I later worked at for over 10 years; for that matter, they're still using the same operating rooms, although not for much longer. (There's a new hospital under construction and the pronounced need for a new OR suite was one of the driving forces behind that.) I remember that the doctors would do rounds, trailing a mob of medical students, who were still almost all male, back then, and at 12 I was aware enough of boys to enjoy that quite a lot. I remember being utterly and completely bored for most of the week after the surgery and listening to music a lot. One band I particularly remember listening to at the time was Bread, which is one that hasn't worn quite so well. (Everything I Own was maybe their big hit at that time; later they would have big hits with "If" and the theme from the move "Goodbye Girl" - they were a fixture all through the 70s, really.) Anyway, I had the surgery and everything went fine, but it was a big life event for a 12-year-old. I saw the prompt from a few days ago about Christmas crafts, and it got me to thinking. The thing is, my mother was an elementary school teacher, and we grew up doing LOTS of crafts. It was how she kept us entertained, quite often. I'll have to go see what I can find as far as pictures. I know I used to have some of that old stuff still around. And well, I've looked, now, and I can't find pictures of anything that was one of my mother's projects, so far. I know that one thing - probably the oldest I remember - was pasta glued onto cardboard and spray-painted gold. And those were hanging around for a surprising number of years. And I think maybe there were some salt-dough ornaments, and I know there were some felt birds that were mostly Mama's doing, because they date from before we were old enough to have been much help, there. I'm pretty sure I still have at least one of those birds around somewhere. 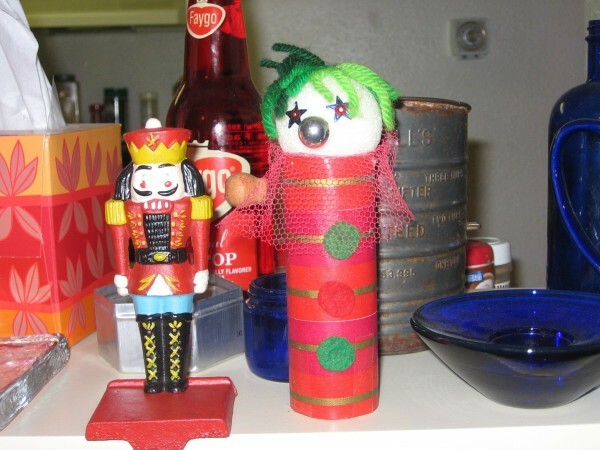 Not the nutcracker, the clown. Recycling (I won't try to call it upcycling) toilet paper rolls is not a purely recent idea. 1. Eggnog - Yay or Nay? 2. Do you say "Merry Christmas" or "Happy Holidays"? Really, I didn't used to think twice about it one way or the other. But nowadays, well, this is what the "War on Christmas" has done for us - every time somebody says "Merry Christmas" I wonder whether it's a greeting or a political statement. (This is especially true if it's a business we're talking about.) It's funny, though, "Merry Christmas" still pops out of my mouth sometimes - it's what I was brought up with, I guess. In writing I'm much more likely to say "Happy holidays" without even thinking about it. Kind of strange, but there you are. 3. Does your family have any special Christmas Eve traditions? Share them, if you'd like. We say "Christmas Eve Gift!" to one another, along with a hug and/or kiss. I guess that's the gift, see. Also my grandmother (who is gone now) used to always try to open a gift on Christmas Eve, even though we don't do that in my family. That was a tradition, too - everybody waited for her to do it (and I suspect she knew that perfectly well). Other than that, the tradition is that the grown-ups sit around and drink and the kids play games and squabble. (That's just what everybody does, right?) And we have some sort of casserole or something for supper that isn't too much trouble to prepare - we save the big meal for the next day. But you're allowed to dip into the desserts so everybody still gets utterly stuffed anyway. Some years we have gone to the carol service in the past, but the last time we went it turned out to be contemporary and not real carols at all, which infurated me. So I am on strike there unless somebody guarantees me the real thing. I think maybe I'd have to go with some of those real old-time Christmas carols on this - "Angels We Have Heard on High" maybe. 5. What is your favorite Christmas memory? My mother pretending she heard the reindeer bells, when we were little. We got so excited. 6. What is your favorite Christmas movie? 7. What's the best gift you've ever gotten? What about the worst? We had a discussion on Twitter the other day about toothbrushes as a bad gift. (It began with talking about giving toothbrushes at Halloween, which is a whole different matter.) I think it was when I was 17 that we were on a trip and my mother wrapped up toothbrushes and gave them to my sister and me as gifts. We both thought that was very silly, although I suppose we should have been more gracious about it. (We were 17 and 16, it's not an age where one tends to be gracious about things like that.) I know we got some other gifts that year but that's the one I still remember. On the other hand, we were in TELLURIDE. SKIING. That was a damn good gift, right there. So maybe that year was the best and worst all wrapped up in one. 8. Do you leave cookies out for Santa? Only if there are kids around, which in recent years there haven't been. The kids presumably go through this ritual at their own houses. 9. Do you believe in Santa? If not, who convinced you that he’s not real? I'm a natural skeptic, I stopped believing when I was 7 or 8. I pretended I did for a couple more years, though - I was afraid if I admitted it I wouldn't get presents any more! 10. Do you go caroling? Not in years. In high school I was in choir and we did actually go around and carol at people's doors in the old-fashioned kind of way. Even in the 70s this seemed pretty retro and a lot of people didn't seem to know how to respond. 11. Have you ever gotten a kiss under the mistletoe? Yes, but mostly not anybody terribly interesting. Seems like back in high school, a million years ago, some boy that I thought I liked did kiss me, but I don't even remember who it was any more. That's sort of sad, I wish I remembered! 12. Who would you most like to encounter under the mistletoe? I dunno, Karl Urban, maybe. Sadly, I can't even think of a particular celebrity crush to mention right now. Twenty acts I've seen live, with annotations. 1. REM - Municipal Auditorium, 1985? 2-3. Echo and the Bunnymen, probably 1984, Ocean Rain tour? We were right up front and almost got squashed, thanks to my friend Rick who was not quite an E&tB groupie. Some terrific band opened for them but I can't think who it was (dammit), but I know that Billy Bragg was the middle act. Really great concert. 4. Stevie Ray Vaughn - at The Ark Co-op, 1981. (That was where I lived, and he played our Halloween party and we paid him the unheard-of - for us - sum of $1000. We made tons of money and bought all-new washers and dryers. True story.) And everybody who was there says he was fabulous but to be honest, I was so drunk - and possibly otherwise chemically altered - I don't remember one way or the other. 5. The Police - 1981 or early '82, at the Drum/Erwin Center/whatever it's called these days. (Hereafter referred to as the Drum.) Ghost in the Machine tour. 6-8. Fleetwood Mac - on Halloween, I think, in the Drum. Stevie Nicks wore a witch's hat and disappeared backstage between every number, and since this was pre-rehab days, we thought we had a pretty good idea what she was doing back there. But they were good. And Glenn Frey was the opening act, rather strangely, and I want to say the Fabulous T-birds as well. 9. Frankie Goes to Hollywood, at Municipal Auditorium at the height of their "Relax" success. Surprisingly fun. 10. New Order - at Municipal Auditorium, 1985. I fell asleep. Seriously. They were that boring. 12. The Cars - another one at the Drum (you notice that's where the big acts played) - I used to have a t-shirt that said "THE CARS ON THE ROAD 1982" and it had a tire track across the back. I wonder whatever happened to that shirt. Seems like I remember Rob wearing it not too many years ago. 13. U2 - seems like it was the "Bad" tour. I was disappointed, really, I had heard so much about how great they were live. They were fine, but if you've seen that old "Live at Red Rocks" video? It was exactly like that. Except without the rocks. 14-15. Tom Petty - man, I almost forgot about this one. At the Drum, with Lone Justice opening. 16. Jerry Jeff Walker and Gary P. Nunn, at the Opry House for some political benefit, 1981. 17. Dan Fogelberg, twice - 1979 and 1981, I think. Shut up, I was still a teenager. 18. Jackson Browne, c. 1980. This one also falls into the hall of shame nowadays, doesn't it? But I loved him at the time. 19. Michael (Martin) Murphey, 1977. It was free. 20. Howard Jones, with somebody cool and completely off-kilter opening for him. Unfortunately I can't remember now who that was. 21. (Because I just remembered another interesting one) Timbuk 3, at the Texas Union, probably in '85. Right on the cusp on their one-hit wonder fame. Man, and I left off David Bowie, too. How could I forget him?